A much-needed comprehensive resource, Endocrine Pathology covers clinical, radiologic, biochemical, molecular, cytogenetic, immunologic and histopathologic aspects of endocrine disorders, including the full spectrum of both neoplastic and non-neoplastic lesions. The first section of the book provides an overview of the clinical presentations of endocrine diseases, while the second section reviews the wide variety of investigative techniques used in their diagnosis. The third and largest section provides a comprehensive tissue- and organ-based approach to the diagnosis of endocrine disorders, including morphologic, genetic and proteomic features with clinicopathologic correlations. All chapters are richly illustrated with numerous color images, tables and algorithms, and the book is packaged with a password, giving the user online access to all text and images. 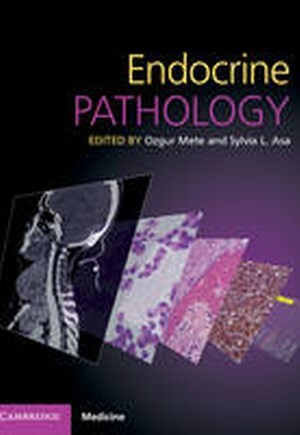 Written and edited by the world's leading experts, this comprehensive and up-to-date book is the definitive resource on endocrine pathology for all pathologists, endocrinologists and researchers. List of contributors; Preface; Part I. Clinical Approaches: 1. Clinical presentations of endocrine diseases Karen Gomez Hernandez and Shereen Ezzat; 2. Familial endocrine tumor syndromes Charalampos Lyssikatos, Fabio R. Faucz and Constantine A. Stratakis; 3. Immunologic basis of endocrine diseases Shawn Winer, Hubert Tsui, and Daniel Winer; Part II. Investigative Techniques: 4. Biochemical testing Paul M. Yip, Karen Gomez-Hernandez, and Shereen Ezzat; 5. Radiologic imaging Artur Salmaslioglu, Baris Bakir, M. Gulbiz Dagoglu Kartal, Michael Chan, Juan Pablo Cruz, Walter Kucharczyk, Eugene Yu, and Karen Gulenchyn; 6. Cytologic assessment Scott L. Boerner; 7. Intraoperative consultations Ozgur Mete and Sylvia L. Asa; 8. Morphology and immunohistochemistry Robert Osamura; 9. Cytogenetic testing methods Hong Wang and Cuihong Wei; 10. Experimental models of endocrine diseases Toru Tateno and Tae Nakano-Tateno; Part III. Anatomical Endocrine Pathology: 11. The brain as an endocrine organ (including the pineal gland) M. Beatriz S. Lopes, Sugoto Mukherjee, Michael A. Reardon, and Carrie A. Mohila; 12. The pituitary gland Sylvia L. Asa and Ozgur Mete; 13. Thyroid Vania Nosé, Ana Carolina de Jesus, Ozgur Mete, Sylvia L. Asa, Marco Volante, Mauro Papotti and Darcy Kerr; 14. Parathyroid gland Lori A. Erickson; 15. Adrenal cortex Kai Duan, Thomas J. Giordano and Ozgur Mete; 16. Adrenal medulla and extra-adrenal paraganglia Lindsey Oudijk, Ronald R. de Krijger, Karel Pacak, and Arthur S. Tischler; 17. Endocrine lesions of the gastrointestinal tract Stefano Serra; 18. The endocrine pancreas Stefano Serra, Frediano Inzani and Guido Rindi; 19. Liver in endocrine disease Oyedele A. Adeyi and Sandra E. Fischer; 20. Pulmonary, thymic and mediastinal neuroendocrine lesions Mauro Papotti, Sylvie Lantuejoul, Giulio Rossi, and Marco Volante; 21. The kidney in endocrine disease Clariss Cassol and Carmen Avila-Casado; 22. Endocrine aspects of the male genitourinary system Michelle Downes; 23. Endocrine lesions in the mammary gland Tadao Nakazawa and Tetsuo Kondo; 24. The placenta N. J. Sebire and A. R. Bamber; 25. The gynecologic tract – neuroendocrine tumors and ovarian tumors with endocrine association Marjan Rouzbahman and Blaise Clarke; 26. Skin manifestations in endocrine diseases Karen A. Naert, Nadya Al-Faraidy, Ayman Al-Habeeb, Danny Ghazarian, Cuyan Demirkesen and Can Baykal; 27. Cardiovascular system in endocrine disease Pooja Singhal and Jagdish Butany; 28. Soft tissue in endocrine disease Brendan Dickson; 29. Bone in endocrine disease Brendan Dickson, David Goltzman and Richard Kremer; 30. The approach to metastatic endocrine tumors of unknown primary site Sara Hafezi-Bakthiari and Ozgur Mete; Index.